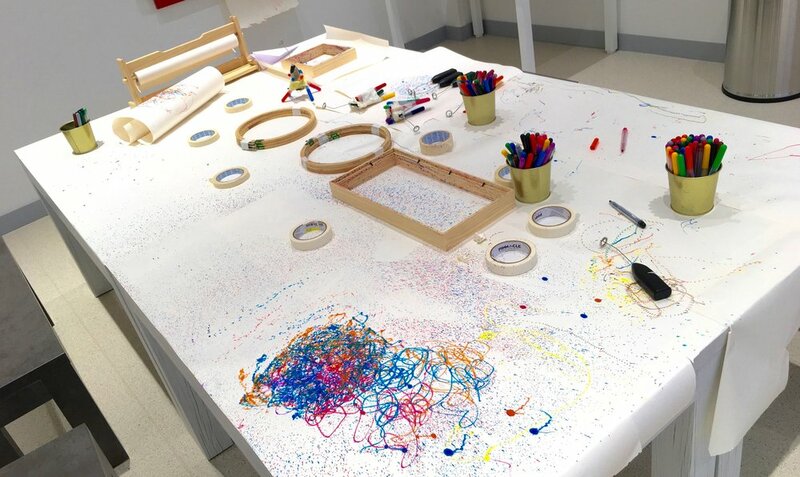 I really wanted to do Scribble Bots in the Creative Lab during our soft launch because they are the perfect mix of making, tinkering, and art that we are going for. I had just one issue though: as a Dubai Noob I had no idea where to find hobby motors! I could always buy some toys and hack the motors out of them, but it seemed crazy to do that at scale 20+ times. Plus, I didnt have any of my normal electronics tools like a soldering iron, so even if I hacked a bunch of motors, I couldn't modify, or importantly, repair them if/when they got broken. I never thought Id say this but I actually missed RadioShack!!! With this dilemma in mind I took a long slow wander through IKEA for inspiration and got lucky! I found my solution: a gigantic bin of PRODUKT Milk-Frothers! At just 4aed a pop (about $1) these were the perfect source for large quantities of hobby motors. As an added bonus, the motors were encased in a protective hard plastic shell and already had something attached to the spigot/spinney part. If you want to make an instant scribble bot with one of these, just bend the bend foamer part and go to town with markers and masking tape! And that is basically what we did! Using a bunch of MALA markers, MALA paper rolls, and some DAIDAI plant pots rounded this activity to being about 80% IKEA. If only IKEA sold masking tape. A fun thing we tried was adding large embroidery hoops and IKEA picture frames to act as fences or borders for our bots. I love a free range bot but the frames add a nice element to the activity, allowing visitors to cut out their shape when they are done for a truly unique work of art. How the bots acted inside the frames was also really interesting and a welcome added bit of tinkering. - Its hard enough to get the Foamers to balance on taped markers, that our younger visitors (4-6yrs) could not do the activity on their own. Even if you teach a kid how to rip and use tape it was still too challenging for those with less developed motor skills. As we are a children's museum I really wanted to get this activity accessible for children as young as 4 year olds but still be interested for the older kids and adults. - The foamer bodies were so narrow it was difficult for people to get their scribble bots to balance. Many people used a ton of masking tape to get it to stand up and be stable but that created another issue when they would discover they accidentally covered the on/off switch! 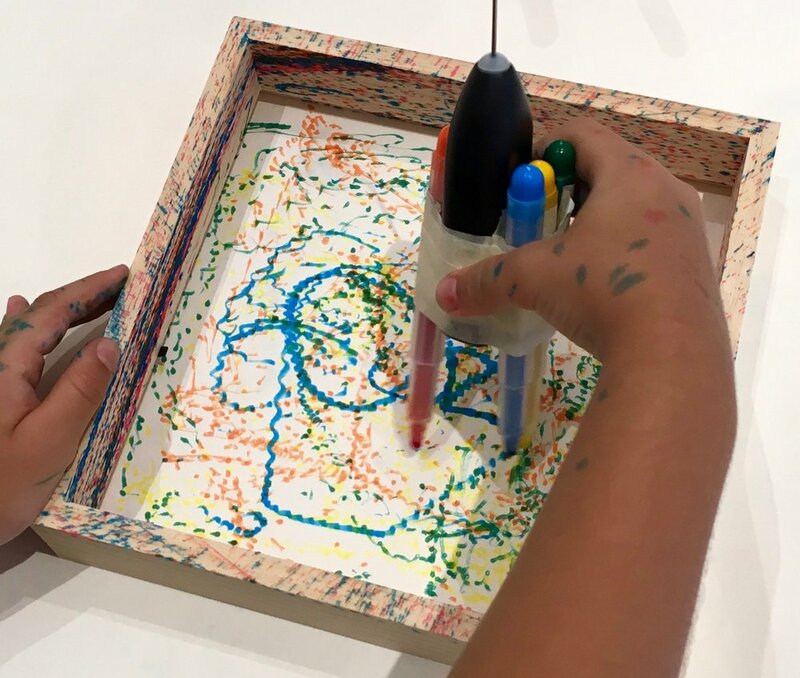 - We had a very funny, and messy, situation where a couple different younger visitors grabbed the bot by the metal foamer part which caused the body of the bot to spin around very very fast spraying marker ink EVERYWHERE. While all the parents were great sports about the mess and it created some really beautiful designs (splatter bot > scribble bot? ), it is definitely something to consider in future iterations.